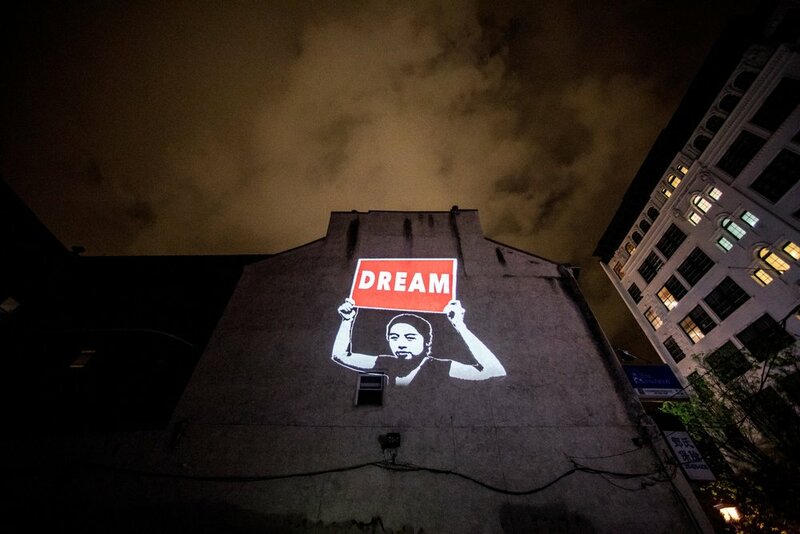 In the spring and summer of 2018, the Chinatown Art Brigade collaborated with Philadelphia based social justice organizations Asian Americans United, Vietlead and the Asian Arts Initiative to amplify the crisis on our US borders and disseminate Know Your Rights information to undocumented immigrants. 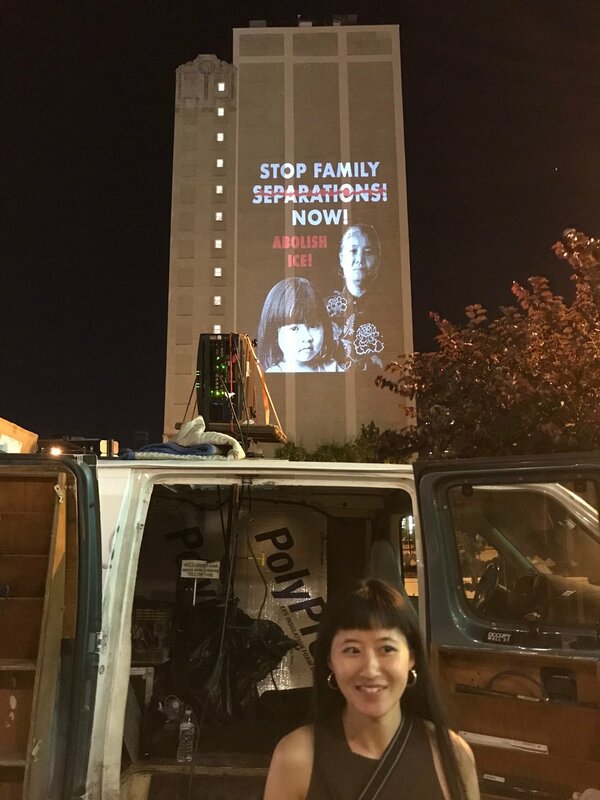 Created in Partnership with the Illuminator, a series of large-scale light projections targeting the ICE headquarters located in the heart of Philadelphia Chinatown were staged across the community on May 4th and July 7, 2018. The Here to Stay Project was commissioned by the Pew Charitable Trust for (ex)Change: History, Place, Presence; a series of site specific public art projects celebrating the 25th Anniversary of the Asian Arts Initiative. 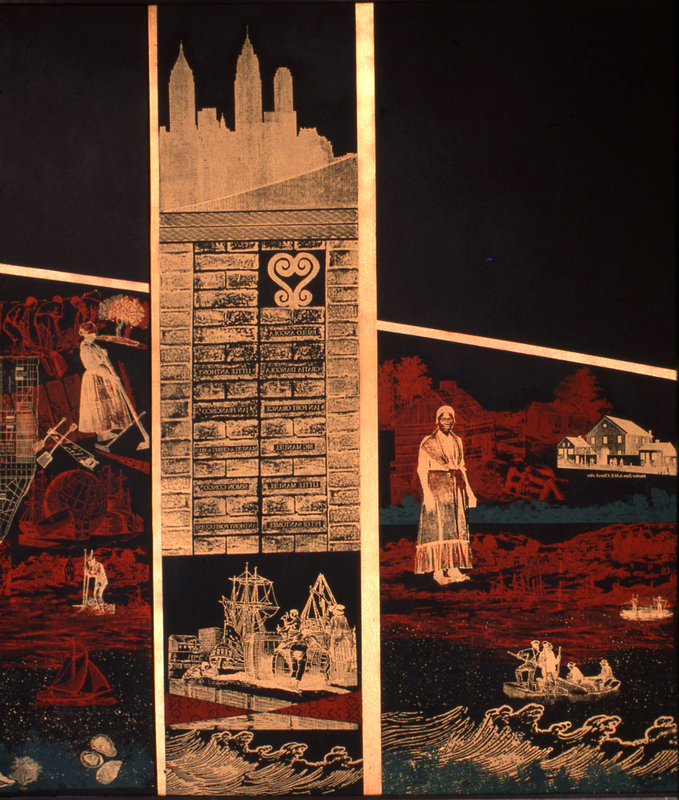 In her work Renewal, Tomie Arai commemorates the discovery of the African Burial Ground and honors the ancestors of New York’s African American descendant community. 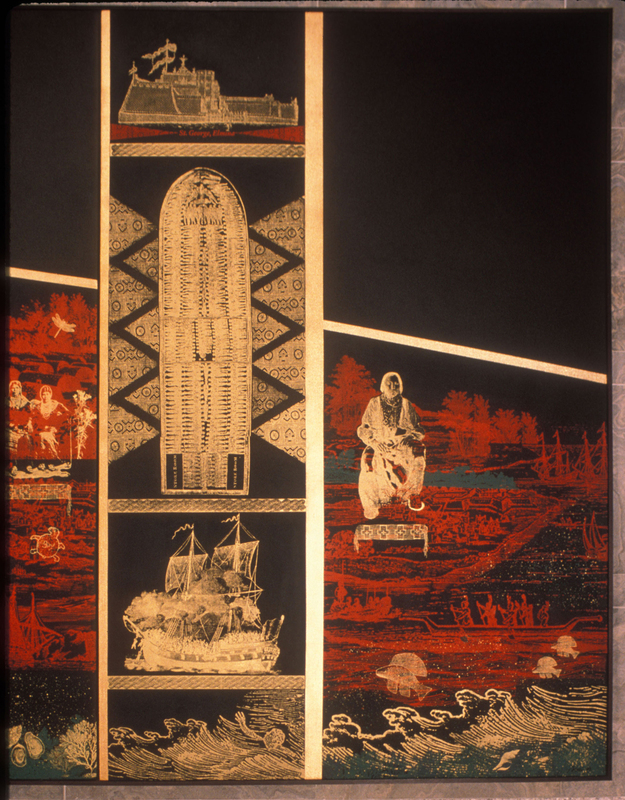 Through the images presented in this silk-screened mural, Ms. Arai encourages us to reflect on the lives of the people buried there. The mural pays tribute to the first enslaved Africans whose labor helped to build colonial New York, spanning the period of time which covers the recorded existence of the African Burial Ground, from 1712 to 1792. Renewal presents a narrative as a series of overlapping images arranged to suggest the process of archeology; digging through layers of historical fragments in order to reveal an untold story about a period in time. Similar to the archeological process of discovery and the painstaking sifting through information, there is no chronology of events presented in the mural. A ‘time line’ has been replaced with a layered reading of events which, for the artist, more closely resembles the actual way in which individuals learn about the past. The significance of the site lies in the unveiling of a hidden history that will have a tremendous impact on our understanding of the present. 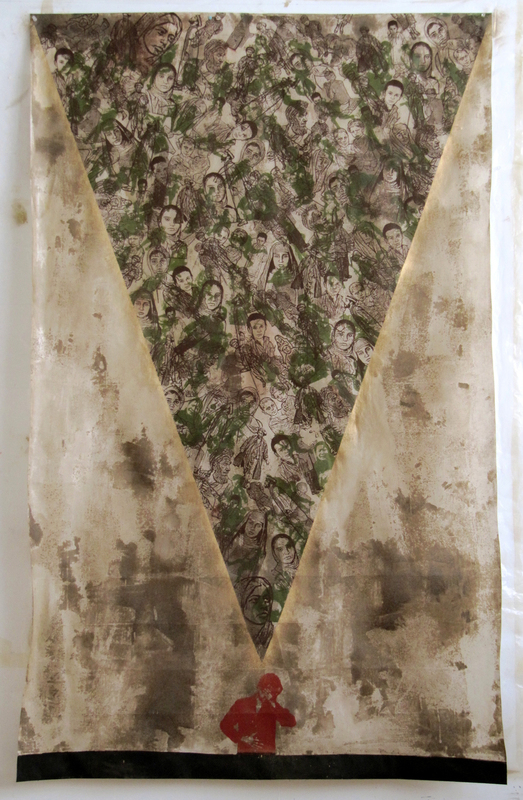 The Shape of Me is a silkscreen monoprint that is composed of dozens of images of Afghan men, women and children superimposed over images from the Vietnam War. The banner is printed in camouflage colors to suggest that civilian casualties often go unreported and the lack of media coverage renders them tragically invisible. In spite of these crimes of omission, and as a result of watchdog organizations like the AFSC, the world has born witness to the deaths of thousands of innocent war victims in both Asia and the Middle East. In response to the consequences of war, each of us is presented with the responsibility to say something and do something to prevent more killing. For better or for worse, how we respond to the moral challenges of our times defines who we are, as citizens, as parents, as neighbors, and as members of the global community. The Shape of Me is about this challenge. The installation takes the shape of a large sphere based on the jade Bi or disc traditionally worn by the Chinese as a pendant or talisman. Originating as far back as the Han dynasty, the jade bi has been regarded as a symbol of power and spiritual strength. Silk-screened images of local residents and historical photos cover the surface of this sculpture to create an overlapping cityscape, a swirl of change and flux that reflects the urban environment and the unique history of Philadelphia’s Chinatown. Twenty-four faceted glass windows designed for the north and southbound platforms of the landmark Pelham Parkway Station, on the White Plains Road Subway Line in the Bronx. Pelham Parkway is a tree-lined boulevard that connects Pelham Bay Park with the New York Botanical Garden and the Bronx Zoo. The White Plains Road line and the Jerome Avenue Line are also within the vicinity of large parks in the Bronx, As a way to recognize the significance of these important public gardens and the urban ecology of the Bronx, I’ve created a design based on a panorama of trees and plant life indigenous to New York City. Fall foliage, spring blossoms and summer wildflowers accent glass inserts of historical photographs from Bronx neighborhoods. Ten photographs were chosen from the archives of the Bronx County Historical Society to represent the community surrounding the station. 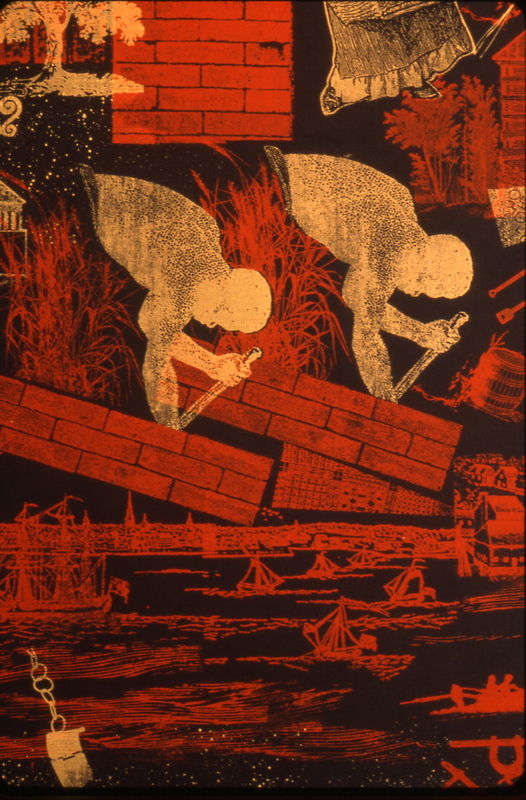 The photographs were screened and fired directly onto glass and span a period in the Bronx from 1899 to 1969. These images include historic views of Prospect Parkway, White Plains Road, Tremont Avenue and specific numbered streets that cross the path of the elevated tracks of the Number 2 subway line.